Whether you have a new kitty or your cat is grown up (and out), at some point it’s time to buy a new litter box. Litter boxes are a cat owner’s best bet to a clean house with an indoor, un-toilet-trained cat. But there are so many options - which do you choose? Which brands are the highest quality and which companies have great customer service? What features do you need to look for? We’ve done the research for you, and created a buying guide for your new litter box. Depending on your living space, preferred cleaning habits, and cat quirks, there are different types of litter boxes to best fit your needs. The four main types of litter boxes to compare are self-cleaning, covered, open-top, and disposable. We also compare larger versus smaller boxes. Self-Cleaning: Self-cleaning litter boxes can be electric or non-electric. Electric self-cleaning litter boxes need an outlet, while some also need a water line hook-up. The most popular ones either have a rotating sifter, use a rake, or wash the litter. Non-electric self-cleaning litter boxes have a creative design that eliminates scooping. Covered: Buying a covered litter box is a popular option with cat owners. The cover adds privacy, catches high streams, and minimizes litter mess from enthusiastic diggers. 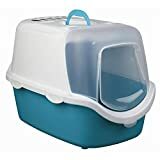 Open-top: An open-top litter box that comes with a shield has similar qualities of covered litter boxes, and are easily accessible for scooping: one need not remove the top to clean the box. An open-top litter box without a shield should have high sides to catch high pee streams and flying litter. Disposable: Disposable uncovered litter boxes are made of a very sturdy cardboard-like material that filters air and reduces litter odors. They do not leak in direct contact with urine and are a clean option for landfills. Disposable uncovered litter boxes come in an assortment of sizes, and are a popular option to pair with litter box tops. Note the dimensions, as disposable litter box bottoms generally have smaller dimensions than those of non-disposable boxes. Disposable litter boxes last from 2 weeks to 6 months, and are usually priced at $10 for three regular or two jumbo sized boxes, and at $5 for one small sized box. Larger sizes tend to have higher sides, which help keep in the mess for competitive sprayers. Disposable litter boxes fit in tall (13 gallon) kitchen trash bags. Larger: Larger litter boxes have dimensions of around 23” x 18” and will fit larger and adult cats. There are litter boxes even larger than this in case your fur ball is lion sized (25+ lb). Note that larger boxes need more cat litter to maintain a litter height of 2” - 4”. In spite of this, some cat owners prefer larger litter boxes so that they need to scoop less often. Smaller: Smaller litter boxes have dimensions around 19” x15” and are good for kittens and small cats. Smaller litter boxes are helpful for using less cat litter to maintain a litter height of 2” - 4”. No, keeping the smaller litter box will not make your pet start dieting so that it can fit into its jeans. It will leave signs on your floor and furniture to let you know when it’s time to upsize. We’ve scoured the reviews and conglomerated a list of comments of litter box features and issues. Litter box features help you look for the right litter box. Litter box issues provide solutions to cat owners’ common questions. Size: Cats tend to be around 10” in height, 18” in length minus the tail. 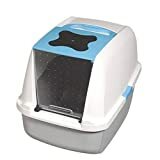 Dimensions of the litter box that would be comfortable for a normal to large cat (13+ lbs) should be around 22” L x 18” W. It is important that your cats can fit inside so that they will use the box instead of the floor. Shape: The bottom should be smooth and flat so that the litter is easy to clean. A square sided box is easier to clean than one with rounded corners or a circular box, as most scoopers cannot reach rounded corners cleanly. Although one can turn a scooper on its side to deal with hard to reach areas. Privacy: Closed-design litter boxes provide your princess some much-needed powder room privacy. Doorway: The doorway of the covered litter box should be sized large enough to fit your cat even when it’s toting those few extra pounds from eating the family size dinner you left on the counter. Cat weight varies widely, but for cats on the larger side, look for doorway width of at least 7”. Closed doorways work as odor-control but they have received negative user reviews because of poor quality, and users often remove them and use other odor-control methods (see “Odor-control” in this list). A high doorway helps against litter spills as the cat exits. Litter mats are useful in tangent with litter boxes (especially open-top boxes) to catch litter that sticks to their paws. However, most mats have received negative user reviews either because of difficulty cleaning or because many cats long jump over the rough material on their way out. 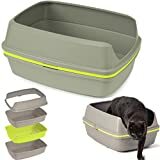 Top-bottom seal: A covered litter box should be easy to open and close for scooping, but should fit properly so that the cat doesn’t accidentally pop the lid off and so that high streaming urine leakage or litter mess does not pass through. Handle: Most litter box handles are made for lifting off the top to scoop, rather than for carrying the litter box from place to place. The top-bottom seal of covered litter boxes are usually not strong enough for litter box relocation. Scooper: While many non self-cleaning litter boxes may come with a scooper, these are usually smaller or made of plastic. If scooping becomes a nightmare, look for larger metal scoopers, or even appropriate the slotted spoon from your kitchen. However, a small scooper may be best for litter boxes with rounded corners. Odor-control: There are no real solutions to odor-control other than regularly cleaning out the waste. Don’t look at me like that. I know you like cleaning. Filters: Carbon filters are rated more effective than charcoal filters on Amazon reviews and Google forums. However, the majority of cat owners agree that the most effective odor-control is (the dreaded) maintenance. Use clumping litter so that waste does not stick to the box; regularly scoop clumped kitty waste; and dispose of it into an airtight waste container. A covered litter box helps a small amount with odor-control. Some cat owners buy covered litter boxes with a swing door so that the odor is even more closed off. However, swing doors have not been rated highly for most brands, as many cats will not push the swing door to climb inside. 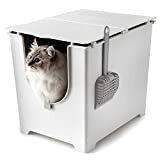 Additionally, a completely closed box may trap litter dust inside and make it hard for a cat to breathe while using the box. 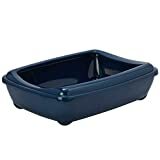 Liners: Despite their claims to the contrary, all plastic liners used inside litter boxes are vulnerable to tearing; also the cat may not use the box because of unfitted liners that fold and let waste pool. Scooping may also be more difficult with liners because the scoop can get caught or poke a hole in the folds. Many cat owners use clumping litter instead of liners, which minimizes the frequency of box washing. Lining litter boxes with baking soda or Ammo-Carb, or using baking soda-laced litter may reduce odors for a short period. Disposable litter boxes have an air-filtering material that helps keep litter a bit drier. 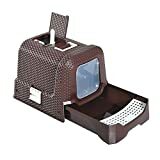 Some pet owners wash their box twice a month, but the majority of litter box users agree that washing the box is unnecessary when using clumping litter. The bottom line in odor-control is the use of clumping litter, frequent scooping, and the use of airtight waste receptacles. You can use a garbage bag-lined trash can with a cover as a waste receptacle. Mess: Inevitably, your floors will be a repository for cat litter. Will we cry about it? (Yes.) The best solutions for litter mess is to use a covered litter box and to sweep often. High entrance boxes, cat mats, and litter box stairs or ramps do not ensure that litter stays off the floor. Litter will stick to the cat’s paws no matter what, and your cat will sit on your keyboard. Steps/Ramp: Litter boxes with a ramp or steps help catch litter pieces on the way out. Make sure to vacuum or sweep the steps, however: if enough litter builds up on the steps, the cat may think it is part of the litter box. Because vacuums may clog from cat litter, use a small hand vac. It will be cheaper than possibly ruining your regular vacuum. 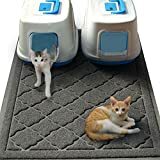 Mat: A litter mat may catch part of the litter trail, but be warned: most reviews read that litter mats are hard to clean and are abrasive on cat paws so that the cats vault over them. Further, even if your entire abode is lined with a giant cat mat, litter still wins. Dust-control: Some cat litter produces less dust than other brands. Dust is mainly a problem when pouring new litter, and not so much from cat digging. Some cat owners vacuum the air nearby while pouring high-dust litter to catch the initial dust deluge. However, most wait for dust to settle, and then vacuum or sweep the dust. Wasting litter: Litter boxes that waste more clean litter than others are uncovered litter boxes, large litter boxes, and self-cleaning litter boxes. Number of boxes per cat: The number of litter boxes is mostly a matter of what you are willing to put up with cleaning. Fewer litter boxes mean you must clean them sooner because of odor, because the litter gets used up when surrounding more waste, and because a cat may reject a dirty litter box and find a clean corner in the house instead. More litter boxes mean that you have more boxes to clean. Note that boxes in dispersed locations create a mess in more places and leave one with more waste containers to change. Types of litter: Types of cat litter include regular clay, clumping clay, biodegradable, or silica gel (crystal) litter. Clumping and Silica gel litter are easiest to clean cat waste and work best at odor-control. Silica gel litter is more expensive than other types of cat litter. Look for dust-free litter so that you and your cat are not sneezing. To find out more, we rated the best cat litters for you! Amount of litter: The amount of cat litter needed per month after the initial fill depends on the type of litter and the number of cats per box. Those who use clumping litter tend to scoop waste, and they use less litter per month. Those who use non clumping litter tend to change the litter from the entire box, and they use more litter per month. Scoop frequency must be increased if there is not enough litter in the box (or else the waste will stick to the box). Litter height: Litter height should be at least 2” - 4” deep so that there is enough litter to dig and cover waste. The deeper the litter, the more easily it can hold the cat’s waste, and the less often one must scoop. Some reviews mention that it is harder to scoop deeper litter, but the majority of litter box users do not find a problem with this and mention that a flimsy scooper may be the issue. On the flip side, litter that is too close to the rim of the box may be tossed out more easily when the cat is digging, and may form a sandcastle outside your litter box. If the litter is too shallow, then the pee sinks directly to the box instead of being absorbed/clumped by the litter on the way down. This makes it more likely to have a smelly box, and creates a need to scrape pee off the bottom. Cat owners who use regular litter instead of clumping may use a small amount of litter because they want to toss the whole box of litter out and start fresh each time. Always check the dimensions of a litter box before purchasing. Adult and large cats need a height and width of 22” x 18”. It is better to err on the side of a box that is too large, rather than too small, as long as you have space for it in your house. High sides and covered litter boxes catch higher urine streams and more flung litter. The best odor-control is to use clumping cat litter, scoop often, and dispose of clumped litter into airtight waste containers. Use a garbage bag-lined trash can with a cover as an airtight waste receptacle. One does not need to wash the litter box when using clumping litter, as it ensures that cat waste sticks to litter rather than the box. Inserting a disposable open-top litter box inside of a non-disposable litter box can create a mess in between. Better go with one litter box bottom. Van Ness: Van Ness has been operating since 1945 and is a leader in pet products. Van Ness has made our top ten lists for litter boxes and automatic pet feeders. Amazon reviews laud their products and averaged 5/5 stars for their customer service and 4/5 stars for the quality of their products. Nature’s Miracle: Nature’s Miracle create pet- and family-safe cleaning and grooming products. Nature’s Miracle has made our top ten lists for litter boxes, stain removers, and carpet shampoos. Amazon reviews averaged 5/5 stars for their customer service and 5/5 stars for the quality of their products. Petmate: Petmate has an entire line of cat, dog, and bird products that they sell through leading retail companies. 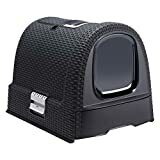 Petmate has made our top ten lists for litter boxes, automatic pet feeders, dog houses, kennels, and dog crates.